Another year, another Call of Duty game. Activision has been nothing if not consistent since the release of Call of Duty in 2003. Every year, around early November, there has been a major release in the franchise. The franchise exploded 2007 with Modern Warfare, thanks to multiplayer perks and a razor-sharp campaign. For a while the developers Infinity Ward and Treyarch pumped out the formulaic shooters in two-year cycles. The precise development schedule was under threat in 2010 when Activision fired two senior employees at Infinity Ward, causing half the studio to leave and reform under Respawn Entertainment. To pick up the slack, Sledgehammer Games was brought in to assist Infinity Ward in delivering the underwhelming Modern Warfare 3 just three years ago. Respawn released their parkour sci-fi shooter, Titanfall, earlier this year. Meanwhile, Sledgehammer Games has been busy creating Advanced Warfare, a new futuristic sub-franchise in the unstoppable juggernaut that is Call of Duty. Set in 2054, the campaign puts you in the role of a United States Marine who loses his arm during the opening mission. While this would normally send Jack Mitchell into early retirement, a military contractor, Atlas, gives him a second chance with a synthetic limb. The leader of this corporation, Jonathon Irons, shares the voice and likeness of a Hollywood superstar. 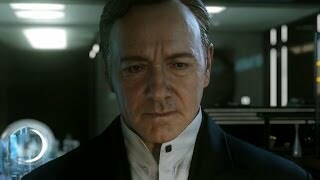 Kevin Spacey creates an imposing presence with Irons, proudly displaying his facial pores as frequently as the predictable narrative allows. Other characters have lazy introductions, but they become memorable through exposure and cringe-worthy dialogue. Most of the story is told in the pre-rendered cut scenes that precede missions; unfortunately they cannot be skipped and have audio issues. All you need to know is that this is ultimately USA versus the bad guys, again, and a major character dies to inspire others to finish the fight, again. Just like previous games in the franchise, the campaign is exceptionally derivative. Rather than trying something new, like Black Ops 2, it merely repeats the exact same scenarios in different locations. There’s a sequence where you locate a rocket launcher and take down a tank while an infinite army attacks. Another section has you dodging sniper fire in the streets of Santorini before you unload rockets into a sniper nest. You will drive a hoverbike through city streets and dodge incoming rockets. Then you pilot an armored-suit that allows you to mow down enemies with your chain gun and rocket swarm. Lastly, but certainly not least, enemies stand atop buses in Nigeria brandishing the completely unexpected rocket launchers. The campaign is not all rockets though, so if you are still excited by a Call of Duty then the variety and briskness will keep it from becoming stale. You will fly a drone above a meeting point and take out enemies silently as comrades move through a building below. Driving a prototype hover-tank is fun, just like in Call of Duty 2, although the lack of challenge makes it less appealing on replay. There is a mission where you rescue the President, but fortunately it breaks the cliche due to context. The game also conjures a different atmosphere in Detroit, utilizing an abandoned school to illicit memories of Pripyat in CoD 4 or Boston in Last of Us. Despite the individual elements being so unoriginal, there is still decent variety. Advanced Warfare is not afraid to borrow ideas from other popular games. Unfortunately many ideas are mere footnotes. The Magnetic Gloves, for example, allow players to scale prearranged walls with just their hands. These are used in half a dozen transitions that would otherwise be doors, zip-lines or ledges. Staring at a wall for minutes compares poorly to shooting enemies while riding a zip-line. How about the ability to whistle and attract stupid guards from within sparse foliage? Not only does this copy Assassin’s Creed, it gives you a grapple hook that makes stealth trivial. Never mind, you cannot whistle outside that one mission anyway. The game is intent on adding elements because they are cool, not because they add depth or consistency. Thankfully not all of the new ideas are a complete waste of time, and the biggest change comes via the inclusion of the Exo Suit - a mechanical frame that allows soldiers to run faster, jump higher and punch harder. The Exo Suit instigates aerial combat and freedom of movement that has not been seen in the franchise. 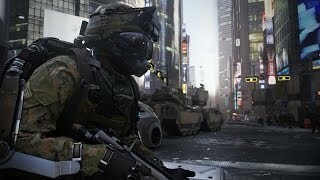 The movement could be compared with Crysis or Titanfall, but there are notable differences to each. Whereas Titanfall was built entirely around wall-running and agile movement, the Exo Suit is more like an additional jump layer on top of the standard mechanics. In Crysis you could switch powers on-the-fly, but the Exo Suit is restricted with a limited battery and preset abilities for each mission. The campaign forces you into one Exo Suit type per mission and you have no choice of starting weapons. One Exo type allows you to boost jump and the other gives you slow-motion. In the case of the boost jump, there are only a handful of sections that use it well. During the first level, you slow your descent with the boosters, but this is only time you will need to descend in this fashion. In one street battle, enemies in the upper level of a restaurant can be surprised by boosting through windows. Unfortunately the windows in the adjacent building are blocked, despite enemies shooting from within. Later, the catwalks on an aircraft carrier are surrounded by invisible walls to prevent you boosting onto them. If you are playing on Veteran, you will take significant damage when jumping about, forcing you back into cover until the strawberry jelly subsides. The boost jump is exploited so rarely that you might occasionally forget it even exists. Similarly, the other Exo Suit abilities are mostly afterthoughts. The brief slow-motion power can only be used about six times per mission, and that is with a fully upgraded battery. Couple this with the lack of effects and it is no substitute for the slow-motion action in other games. The shield works as expected, but given the generous placement of cover it is also unnecessary. A grapple device is used to gain access to preset ledges, and when combined with the boost jump it provides about five minutes of freedom. The Exo Suit sounds interesting on paper, but the implementation in the campaign is restricted and inconsistent. It is disappointing that the campaign can be broken with just one false step. 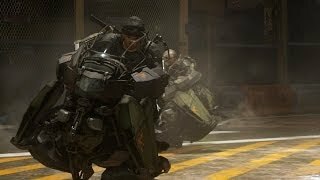 Call of Duty games have always kept the player moving forward with horse blinders, but Advanced Warfare is particularly lazy when the player decides to reword the script. If you push forward too quickly, you will watch teammates run past brain-dead enemies. The playable areas are miniscule, and walking just 15m off the main route will force a checkpoint restart. These side areas are downright ugly, with boxy geometry, fake civilians and missing detail. The game lets you wander offstage before the director slaps you over the head and tells you to begin again from the top. This is perplexing in a game where you must find hidden laptops to unlock all suit upgrades. Overall, the campaign retreads far too much ground, lacks experimentation and forgoes refinement.